Every family has their holiday traditions and in my family this Christmas breakfast casserole is one of them! 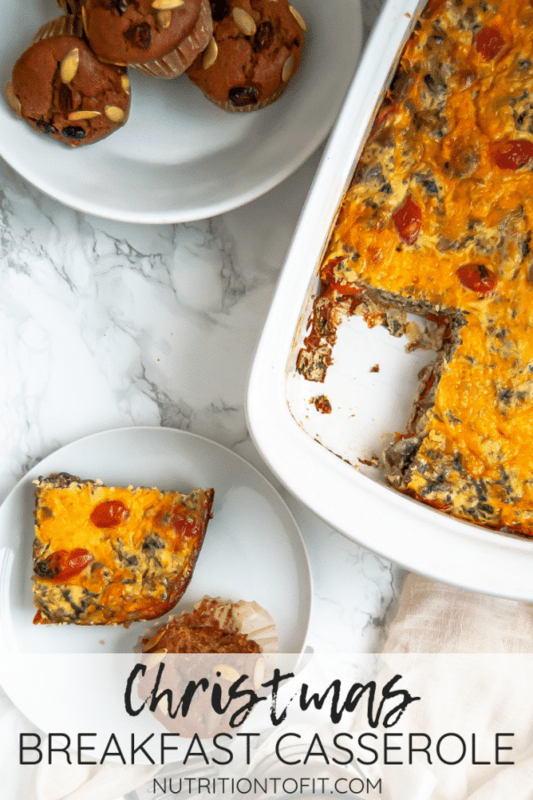 Whether we’re all together or not, this lightened up Christmas breakfast casserole is something we can all enjoy wherever we are! One of the reasons I just love the holidays is all of the sentimentality from the yearly traditions. One of my favorite traditions is this Christmas breakfast casserole. We actually make this on Christmas Eve to enjoy between the hustle and bustle of church services, looking at Christmas lights, and all the excitement for Christmas morning – when we usually enjoy it again! 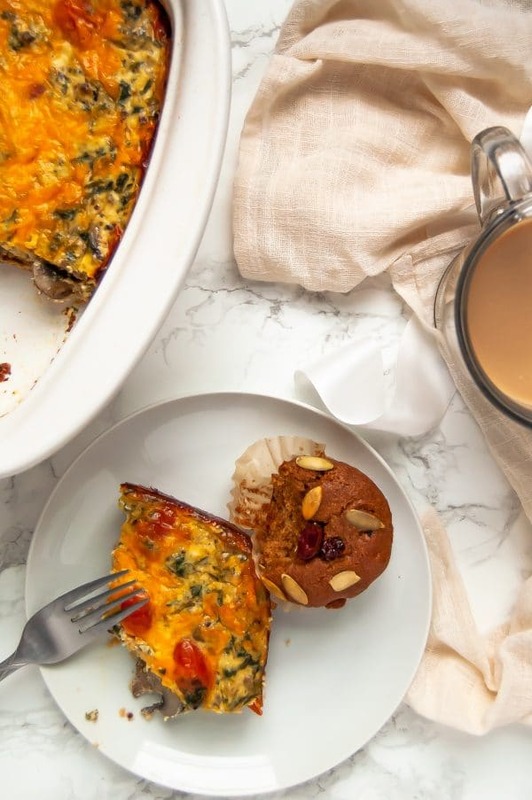 It’s a savory breakfast casserole that over the years I’ve adopted a lighter take on, with swaps like lean turkey sausage, fat free greek yogurt, and the addition of veggies. Start browning your turkey sausage in a large, wide-brimmed skillet. While the turkey is browning, shred your potato and chop your vegetables. Add the potato and saute for a few, then add vegetables and seasonings and saute until tender. While the vegetables are sauteing, whisk together the eggs and greek yogurt. Combine everything together and pour into a 9×13″ baking pan sprayed with olive oil or avocado spray (use one with just the oil, no weird chemical propellants). Now, at this stage you can totally go ahead and bake it if you’re going to be ready to eat in an hour or so. However if you want prep your Christmas breakfast casserole ahead of time, just cover your baking dish at this point and place in the refrigerator until you need it, up to 24 hours in advance. Then bake according to directions! 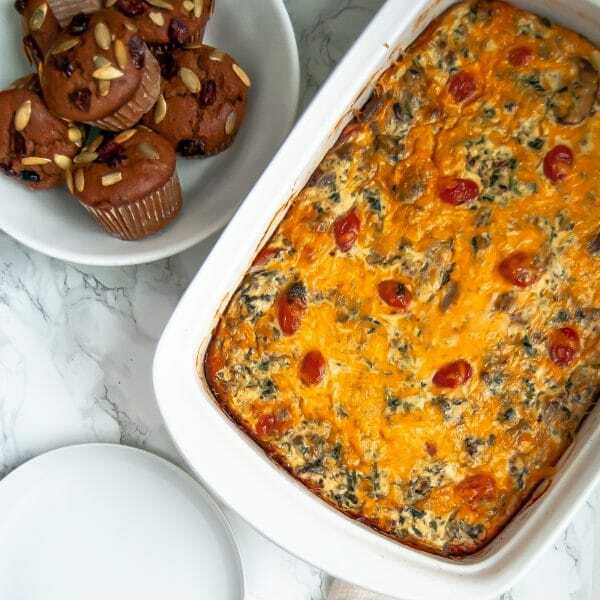 This Christmas breakfast casserole can also be baked and made entirely, and then just reheated. We usually make it fresh to enjoy Christmas Eve night and then reheat the leftovers for breakfast on Christmas morning. Which in our house, gets enjoyed in between stockings and presents! Eggs: still using the whole egg! Did you know almost 3 grams of an egg’s protein is actually in the yolk? Not to mention the yolk is full of incredible nutrients, including all of the fat-soluble vitamins (A, D, E, K) and essential fatty acids. Plus the fats in the yolk contribute to satisfaction – both in taste and fullness! Sausage: instead of pork sausage, I went with a lean turkey sausage to add even more protein and less saturated fats to this dish. Greek Yogurt: definitely not an ingredient in your traditional Christmas breakfast casserole! 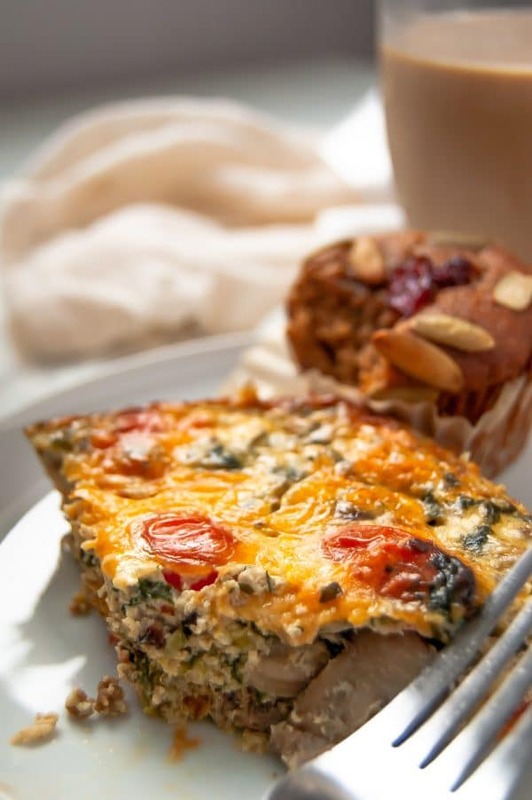 However I find that mixing some fat-free, plain Greek yogurt in frittatas, quiches, and egg bakes adds an excellent texture and creaminess for more flavor and protein instead of something like heavy cream. Shredded Potato: we already chatted about this, but this way you get some shredded potato texture and taste without the chemical preservatives in most frozen varieties. Plus it’s a lower amount to help keep everything more balanced. Feel best eating low carb or avoiding white potatoes? You can totally sub shredded sweet potato, butternut squash, and yes – even cauliflower rice. Vegetables: as a dietitian, I LOVE adding vegetables to pretty much everything! It’s a great way to add fiber, nutrients, antioxidants, flavor and texture. Cheese: still use, but cut back the amount. Can I tell you one of my biggest secrets to lighten up a recipe? If a recipe calls for cheese both mixed inside a food and on top (like pasta bakes, enchiladas, casseroles), try reducing or even eliminating the cheese inside the casserole but leaving the cheese on top. Most of the time there’s not a big taste/ texture notice without the extra cheese inside a casserole like this, but you can really taste it and enjoy it when it’s melted on top! 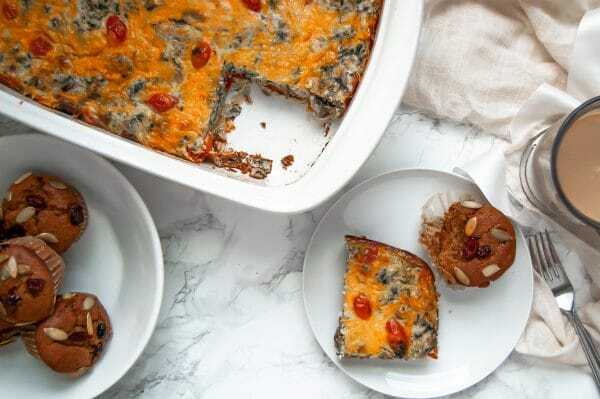 All-in-all, this lightened-up version of a Christmas Breakfast Casserole has great flavor and is perfect fuel for a night of Christmas Eve traditions, a morning of present opening, or whatever your family’s traditions are. Looking for some other recipes to pair with it? Try rounding out your brunch of breakfast spread with my banana oatmeal muffins and healthy baked pears. 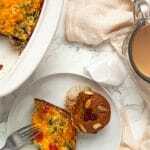 This Christmas breakfast casserole is a lightened up version of the classic sausage, hash brown, and egg casserole. It’s great for breakfast, brunch, or even Christmas Eve dinner, whatever your holiday traditions are! Preheat oven to 350 degrees. Prepare baking dish by spraying with an olive oil or avocado spray. Saute turkey sausage in a large saute pan over medium-high heat until browned. Add shredded potato and saute an additional few minutes until potato is softer. Add tomatoes, mushrooms, spinach, and spices and saute until cooked through, about another 5-7 minutes. While vegetables are cooking, whisk together eggs and greek yogurt in a large bowl. When done, add in cooked sausage and vegetable mixture, stirring quickly. Pour egg mixture into prepared pan and top with shredded cheese. Bake for 45-60 minutes, or until a toothpick inserted in the center of the egg bake comes out clean. Let cool several minutes then enjoy! This recipe is such a keeper!! Than you! This sounds so flavorful, yet filling! This casserole is perfect for the holidays! It would even make a great lunch or dinner! I love all the veggies in this, perfect for Christmas and beyond! I’m a big one for tradition as well. Looks like this needs to be put new tradition!